Shut your pie hole and eat a tasty dessert! 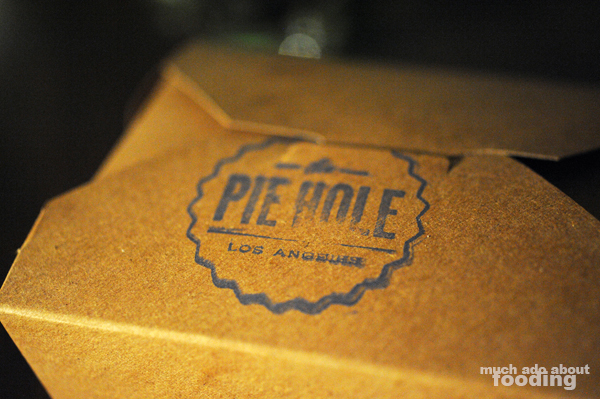 I've heard that The Pie Hole in downtown LA was just about the best place around to get pies, sweet and savory. In honor of tomorrow (my friends have designated it as "Double Pi Day" at 6/28), here's my review of the pie place that had me wanting to hold out a pie plate. I didn't know where it was until one day when my friend told me we'd hit it up after eat.drink.Americano; curious I wondered how far it would be but what do you know? It was just around the corner, quaint and nearly hidden among the Arts District buildings. 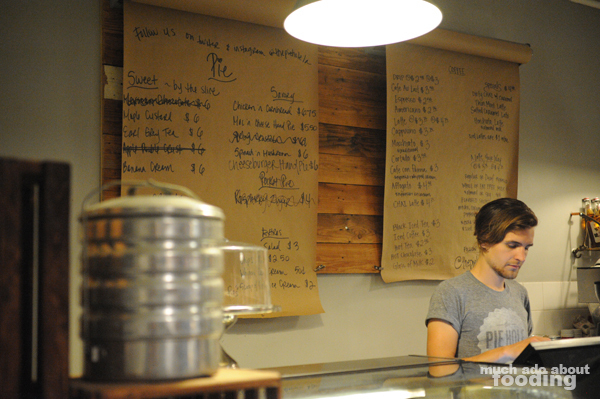 I've been there twice now and have enjoyed each visit but alas, have never had a savory pie. 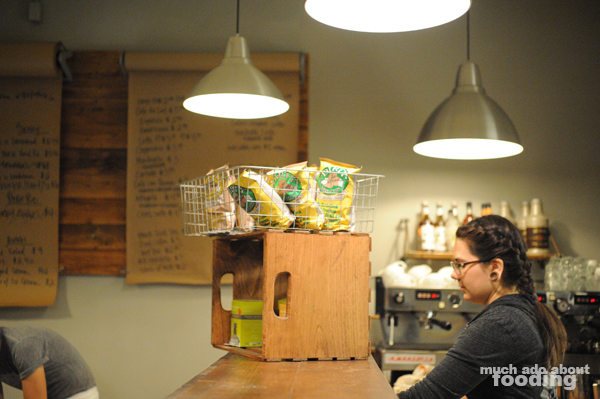 I hope to return soon someday to give another review of their savory offerings. 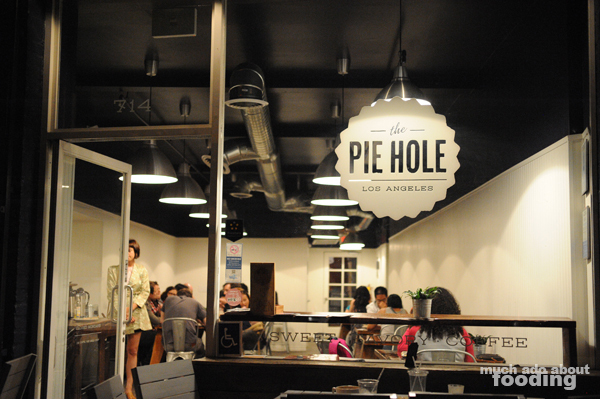 So the neat thing about The Pie Hole is that they offer you the option of sitting in to enjoy your pie on little plates and wooden tables or taking it to go. I've done both and find the eating in part better just because of the environment (and no risk of pie getting smooshed in a box!). I like how they do change their menu daily but still keep around crowd favorites. From $4.50-$6.00 per sweet pie slice, it's on par in price with restaurant pies but loads better because they specialize in the stuff. One day I'll be back for the savory stuff which run just $.50 more in general. 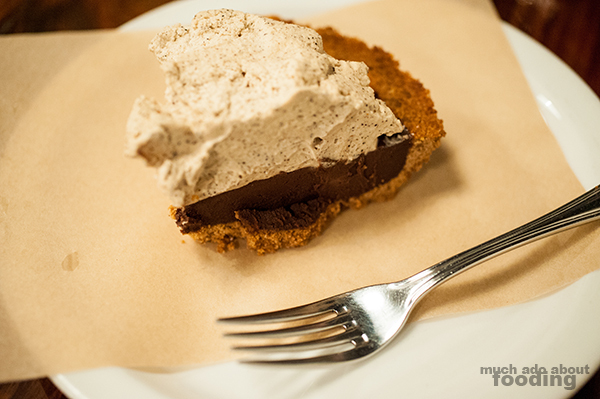 Pictured are the Mexican Chocolate Pie and Earl Grey Pie. Both visits included ordering the latter of those two because it was just so gotdang delicious. The Mexican Chocolate was smooth in chocolate and had plenty of light cinnamon cream on top. There were also crunchy flecks of cacao nibs (I think?) that gave a texture to the creaminess. The Earl Grey definitely made me want to pour a cuppa the same next to it because it had the strong flavors of the tea. 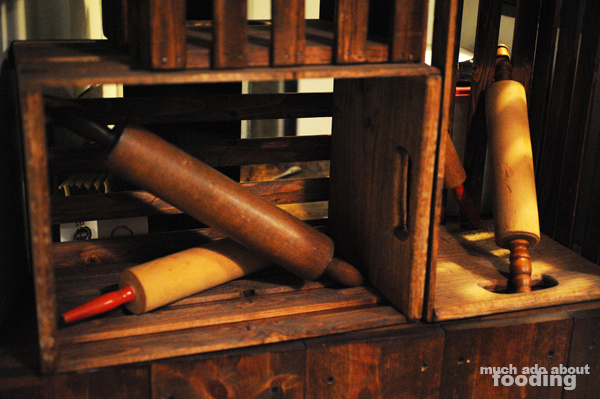 You'd think that turning it into pie form would lose some of the strength but it didn't! 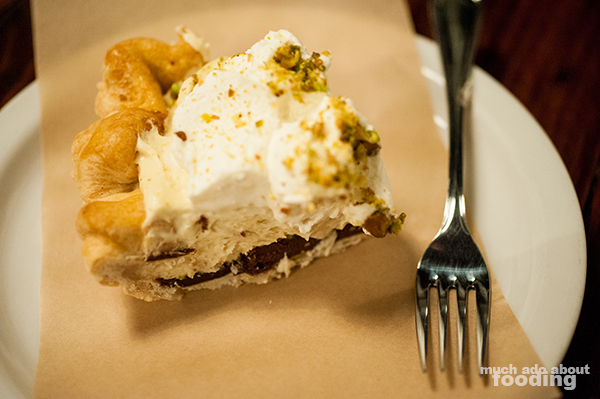 Topped with crushed pistachios, the slice was quickly dispensed of. Another that I've had but isn't pictured is their Maple Custard, a heavenly custard pie that reminded me of egg custard tarts (dan ta) from Chinese cuisine. Sweet with a brulee-d top, I'd say this was something you shouldn't miss. 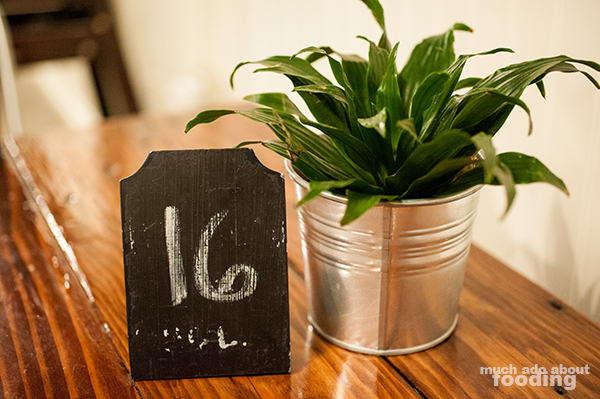 We are absolutely coming back and hopefully in time to get something savory before it runs out. Photography by Duc Duong and Minerva Thai, depending on the visit. Quaint little place in the hip art district. Mexican chocolate is good! The latte was delicious! I just wish the echo wasn't so insane because the loud teenagers were the only downside! Ah - does it get crowded with teens in the afternoons? I've only been late at night, and it's been okay then.